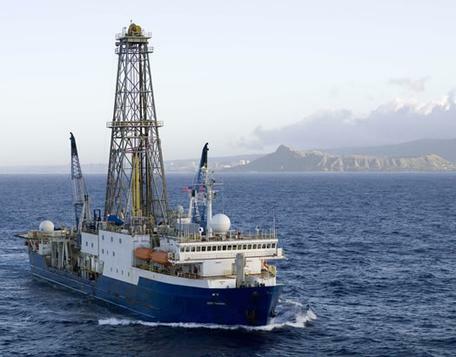 In the summer of 2013, diverse team of scientists on board the JOIDES Resolution sailed to the Gulf of Alaska to collect sediments to investigate Earth's past climate and study the connection between climate and tectonic activity. Led by co-chief scientists Sean Gulick (UTIG) and John Jaeger (U. of Florida), IODP Expedition 341used sediment cores to answer questions about Earth's history. Students will join the expedition and analyze the science data that expedition scientists collect. In this Challenge, every effort has been made to have students experience what it's like to join a scientific expedition and work collaboratively to do an investigation that focuses on uncovering clues to past climate change. They travel along with a group of scientists who extracted sediment cores from several locations along the south coast of Alaska in the summer of 2013. Students conduct hands-on lab activities, watch videos, analyze the actual data from the expedition, consult maps and graphs, explore online interactives, all of which will help them gather evidence to determine when major climate events occurred in the past, and how these events connect with changes in climate today, and in the future. What is the present geologic setting in this region? How have environmental conditions in in the Gulf of Alaska changed during the time when the sediments in this core were deposited? What does the presence of types of diatoms (plants) and their abundance in the core reveal about the timing of the cycles of the advance and retreat of glaciers and ice sheets? What is the timeline represented by this section of sediment core? To address the challenge, students should be divided into teams of 5. Each team will elect a chief-scientist, someone who can pull all the information together and tell the groups' story. The chief-scientist will collect the findings of team members and lead the preparation of the final report. Other team members include an engineer, a sedimentologist, a paleomagnetist, and a paleontologist. Each will be responsible for gathering data and evidence within their disciplines and contribute their findings to the groups' final report. How scientists from many different countries and with different expertise collaborate as a team to examine a science problem. How sedimentary cores are retrieved from beneath the seafloor. What kinds of information can be extracted from the features of sediment cores to give clues to climate change. About the different types of data, including proxy data, used to detect changes in Earth's climate. Methods used to determine when changes in climate occurred in sediment cores. An overview of the Challenge. Description of your contribution to the project. Detailed answer to the Challenge question that required of their special expertise with methodology, data, analysis and diagrams. A summary of their group's findings. The chief scientists report should contain these elements, but focus on the integration of the findings of all the experts and how this information is used to address the challenge questions. 2. A map showing location of (a) the drill hole from which the sediment core was retrieved and, (b) key geologic features and structures present, and any other information you feel is pertinent. 3. A summary of your group's findings (answers to all the challenge questions). NOTE: You can choose to share the criteria to meet the Challenge with students at the beginning of the module. You can summarize them from this page or refer students to the Challenge requirements that are set forth in Lab 6F: Putting the Data Together.